I read books because you don't want to! Who Is The Malaysian Reader? Being of Arab descent (not sure if he’s Muslim though, not that it matters) Saladin Ahmed chose to set his Crescent Moon Kingdoms in a distinctly Middle Eastern landscape with Arabic-like sounding names for his characters and the walled city of Dhamsawaat where most of the story takes place reminds the reader of Marrakesh or Baghdad in the 13th century. The usual fantasy tropes are here: The wise, old teacher is Doctor Adoulla Makhslood. He is the only ghul hunter left in Dhamsawaat and he wants to retire but finds himself facing perhaps the biggest threat of his career when a former lover asks him to investigate the mysterious and seemingly supernatural murders of her family. His young assistant, Raseed, is a devout Master Dervish who doesn’t understand why his body goes all funny when he sets eyes on Zamia, a tribeswoman of a desert clan that was annihilated by perhaps the same supernatural threat that killed the Doctor’s old flame’s family. The characterisation is nice. None of the three are perfect as they all have their own personal demons to conquer and they evolve as characters as the story progresses. Raseed and Zamia are the two that, to me, were the best developed simply because they annoyed me at the beginning but by the end I was rooting for these two crazy kids to beat the Big Bad. I was annoyed with Raseed for his holier-than-thou attitude and Zamia for her us-desert-people-are-so-much-better-than-you-city-folk stance. When a character annoys me because of his or her behaviour and then manage to make me like them by story’s end, I take that as good writing. Throne of the Crescent Moon is atmospheric. Perhaps it is partly because of me tiring of the usual medieval European style fantasy but also Saladin Ahmed’s talent as a writer should be given due credit in creating a fantastical yet at the same time believable fantasy setting. He also doesn’t show his readers every single detail of the world he created, preferring instead to leave it to our imaginations. A difficult balance to achieve but the author pulls it off here. This is the first book in The Crescent Moon Kingdoms series and if this book is anything to go by, I for one is looking forward to Book II. Oh and unlike most fantasy novels out there, this one is only 274 pages long so it’s clearly not a door-stopper. Even that is a refreshing change! So Bro!the story is not about religious or to be specific Muslim culture related underworld fantasy right? Coz I’m a bit uncomfortable with its cover that show a white beard old man holding a book with cross sign on it. So from your review its look like a worthy posession as other reviewers has say about this debut. No, the has story has Middle Eastern influences but it’s not based on Islam or any other religion. I think this sounds fantastic. Definitely going to try and pick it up. I think the trouble with us westerners is that we’re a bit afraid and muddled about all things Middle-East. They truly have a vibrant and rich culture and it should be explored far more, especially in the fantasy genre. I have a few strong Middle-East themes in my current WIP and I can only hope that I can do it justice. Thanks for your review! 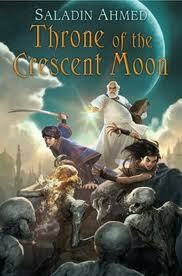 You are currently reading Fantasy Middle Eastern Style In Throne of the Crescent Moon (DAW Book, 2012) at The Malaysian Reader.